Can you Escape from the Dark Czar amid the snows of the Witchlands? 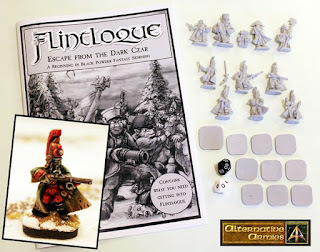 This week we have an event with ten percent off our Flintloque Game System collection which is the beginners box set, all the books in print and digital plus shilling starter packs plus every Flintloque order placed this week will get a free Savant Zombie (worth 2.00GBP) automatically. A good time to get into this huge setting. Click through for more. Thanks.